ON AUGUST 10, Institute of Electrical and Electronics Engineers cancelled its All Kerala Science Congress, owing to heavy rains in the state. The organisers of the event—mostly students from various engineering colleges in the state—were naturally disappointed. Though Kerala was yet to face a deluge then, they started discussing how to help people in the flooded places. Muralidharan M., head of the Kerala state e-governance mission and IEEE subcommittee co-chair, asked them if they could develop an easy-to-use application for volunteer registration and supply of food and medicine. On August 11, a team started working on it and within 14 hours they developed an open-source application, keralarescue.in. The flood situation was getting worse. So, within a few days the website started accepting rescue and relief requests, and collecting GPS data to locate those who were stranded. The state government and the Kerala IT mission soon came forward to collaborate with the site, and keralarescue.in started sharing information with district control rooms and other volunteer groups. “As the number of requests increased, some 1,500 techies from different parts of the world—even those working in Microsoft, IBM, Google and Facebook—joined the team for improving the application,” says Syam Kumar A.S., a techie working with Baker Hughes. Syam says that many of them were working 20 hours a day. The data shared by keralarescue.in were already doing the rounds in social media groups, which were all acting like miniature helpline groups. But, doing a quick check for valid contacts of rescuers and other resources remained an issue for volunteer groups. So, Kallushappu (toddy shop), a WhatsApp group of techies, initiated the development of another web application, keralafloodrescue.com, to address this concern.“We put verified information about different resources on Google Maps so that people can click on some buttons and get the information,” says Raju Sunny, who runs the startup Entropy Analytics, in Atlanta in the US. Numerous call centres working relentlessly to provide rescue and relief assistance groups were set up across the country, especially in engineering colleges like IISc Bengaluru, IIT Guwahati and IIT Hyderabad. When the flood wreaked havoc, most of the helpline numbers were always busy. 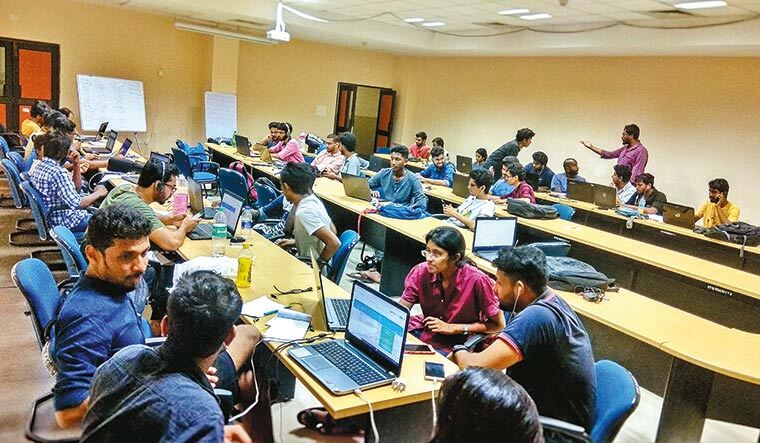 So a cloud telephony-based solution, which enables a single phone number to handle high concurrent call traffic, was introduced by a group of engineers from Thiruvananthapuram and Bengaluru. “We set up our own call centres and published our helpline number. We got thousands of calls,” says Benjamin Mathews Abraham, cofounder of the startup Askerbot. Now, the state health department is using this number as toll free health helpline. There have been thousands of dedicated underground volunteers using technology to help the flood victims. Though rains have abated, their efforts have not. They are still busy rebuilding God’s Own Country, byte by byte.